The mortgage industry is ever changing in today’s world driven by regulatory changes, investor requirements and consumer demands. It is more important than ever to exchange data in a flexible and standard format in order to meet these industry change events. Actualize Consulting is the premier organization with the Mortgage Industry expertise and MISMO® expertise in the industry to affect change in your organization. Our seasoned resources understand and have implemented MISMO®standards for multiple organizations and can do the same for yours. Our level of knowledge, expertise and inclusion in the MISMO® organizational processes and reference model development provides our resources the cutting edge knowledge of both the MISMO® Reference Model and its changes along with the regulatory requirements. 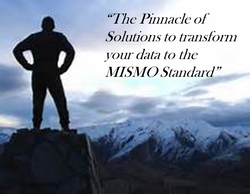 MISMO® is a governing body and consortium that leads the mortgage industry standards definition of terms, term definition, B2B electronic transfer of Mortgage data and engineering guidelines. The MISMO® model is a comprehensive set of data points supporting the mortgage loan life cycle. MISMO®model 3.X is viewed either in a data dictionary or use of the XML schema that can be customized to an organizations data point needs. Actualize Consulting has worked in conjunction with both GSEs in order to craft the Closing Disclosure Data set now out on both GSE websites. Our special skills of data analysis, MISMO expertise and Regulation review and interpretation has crafted a solid data set to support the Closing Disclosure. In addition; working with the MISMO organization, the Loan Estimate form now has a data set in which Actualize Consulting provided guidance and assessment of the organizations draft to support the regulation. Our expertise in the Integrated Mortgage Disclosure regulation and forms can provide your organization the ability to craft the required data, understand the regulation and specifics to using these new complex forms. See our offering for the Integrated Mortgage Disclosure webpage for more information. Download a copy of our MISMO Service Offering.